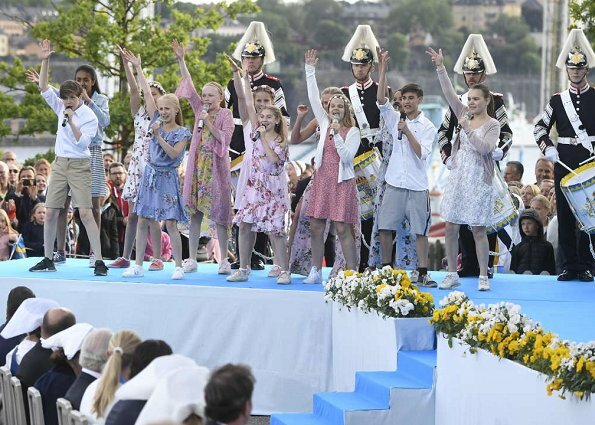 On June 6, 2018, King Carl Gustaf, Queen Silvia, Crown Princess Victoria, Prince Daniel, Princess Estelle, Prince Carl Philip, Princess Sofia, Princess Madeleine of Sweden and Christopher O'Neill attended National Day 2018 concert held at Skansen open air museum in Stockholm. 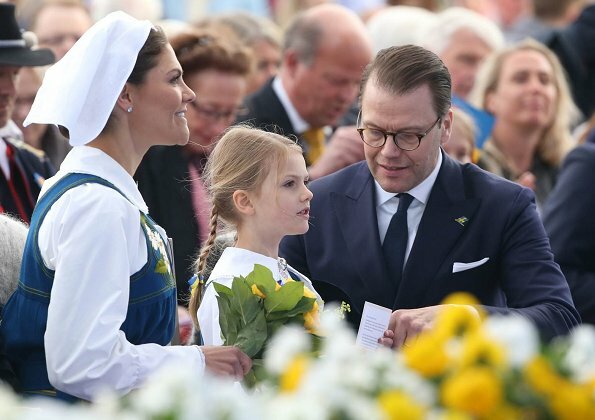 After the celebrations at Skansen, The King and Queen invited representatives from the Swedish Parliament and Government, the public sector and the diplomatic corps to a reception at the Royal Palace of Stockholm. 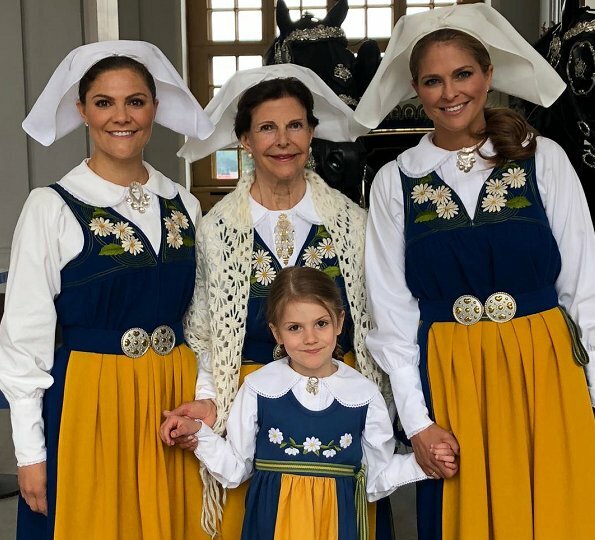 As a Swede I an very proud over the swedish national dress and I think all the ladies look amazing! 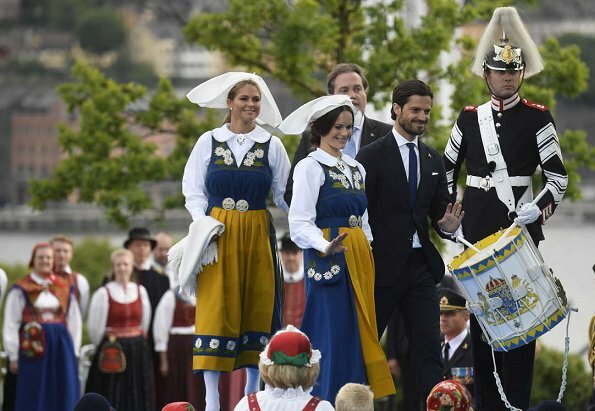 I just wish for that princess Madeleine would stop wearing her silly high heeled shoes cause that is not custom! you can absolutly be proud :-) they are great. No doubt she should respect the national dress. High heels are ridiculous. She probably thinks they are more flattering. How many kinds of national costumes do you have in Sweden ?? They all look so beautiful. !! Jemma Bristow, no It's not custom even if she's far away from the throne, she's actually no 7 in line. She still should wear proper shoes. 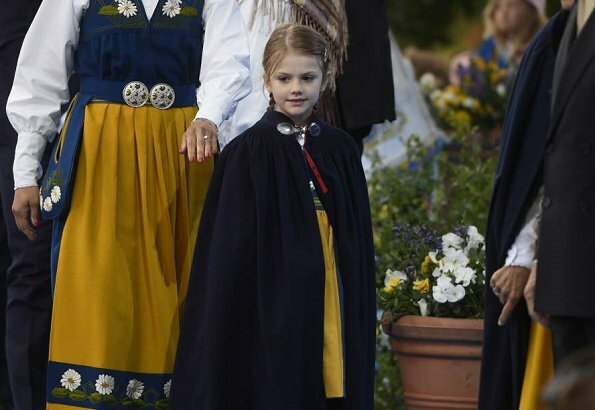 Look at Princess Sofia, her first year she also wore heels, last year she wore flat ballet pumps (still better than heels!) but this year she wears the right shoes with the traditional buckle. Jemma Bristow: Madeleine upon her birth was third in line; now she is seventh (Victoria, Estelle, Oscar, Carl Philip, Alexander, Gabriel, Madeleine, Leonore, Nicolas, Adrienne). Aside from that, her black heels look out of place with the national dress, IMO. Elin & Rosalie - well said tack!! Once again why only the women wear national customs? My question too!!! 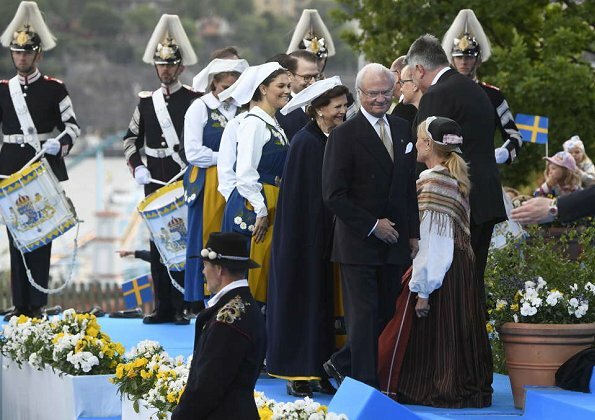 The Norwegian royals all wear their national costume, as I recall. It looks quite strange. 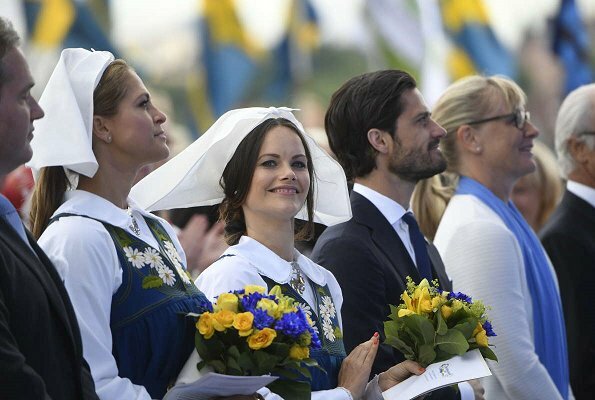 Is there no national costume for Swedish men? 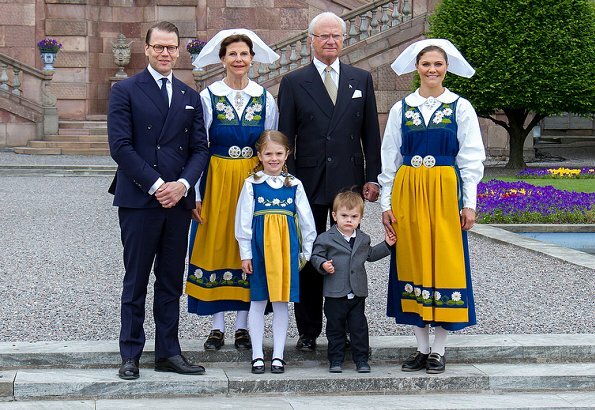 This particular nationaldress is called "Sverige-dräkten". Thats a common dress. I don't think it's one of the the better looking nationaldresses we have. I wish they would choose a different dress every year, so we all could see some of the really beautiful ones. Agree, there are so many beautiful nationaldresses to choose between. Agree. Estelle would look sweet in all of them :). Everyone had a great time. 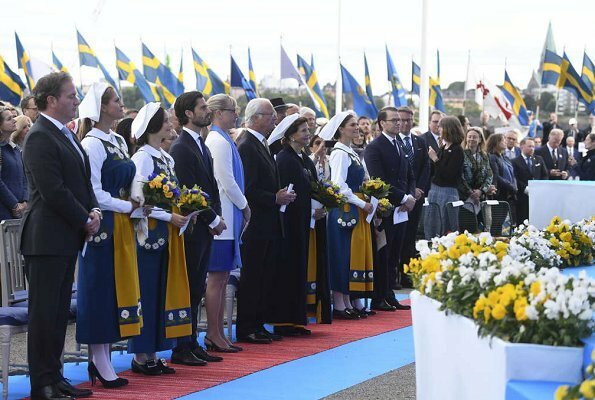 National Day is special to every Swede and the Country. and hey cute little Oscar was there too. 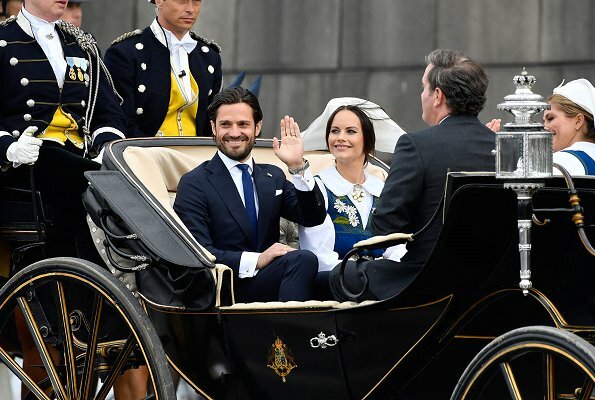 Has Daniel borrowed his suit from Carl-Philip? It doesn´t fit him at all. Die Königin mit ihren beiden Töchtern und Enkeltochter in Tracht , finde ich ganz bezaubernd! ! Beautiful pics, thank you Hellen Electra! My favourite: No 3 adorable Estelle in her cape. Prince Daniels suit looks too tight and wrinkled. Maybe time for a new suit?